Heh. This was a new trick on me. I did not know you could use Nautilus as an ftp client. Here’s how to do it. 1. Open nautilus, then File/Connect to server. 2. Fill in the information, hit connect and you are good to go! I am asked frequently: How can I make my own ftp server? FTP — or file transfer protocol, was one of the original protocols used in the development of the Internet. 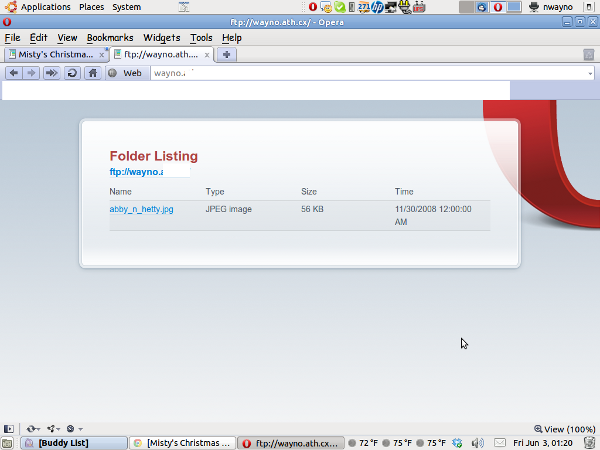 It allows us to transfer files between a server machine (host) and a client. With the advent of peer-to-peer Bit Torrent it might seem that ftp has fallen by the wayside. Bit torrent is great, if you have a lot of the same information to share. Movies or music. 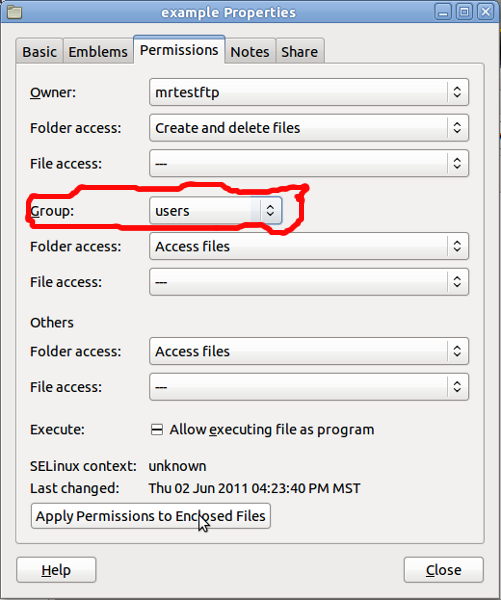 But if you have only a few files to share amongst a small group of people, ftp is the way to go. It’s not hard to implement, but there are a couple of tricks. This post will seem quite lengthy, because there’s a lot of concepts that we need to bring into focus. Security of course. Here’s the setup. I want to use an account on my computer, that is just for sharing files with other people. Rather then have an account that only one local user can see, I need to have it visible to all local users, and to the ftp server. So I stuck everything I wanted to share in /home/misc/example. As always anything and including the octothorpe (#) is a comment, and need NOT be coded! 1. The first thing we will want to do is, get the software! 2. Let’s backup /etc/vsftpd.conf before we begin. (mrtestftp is the user I am using. Change it to whatever you decide. 4. We’re done changing, so restart the vsftpd daemon to re-read all the changes. if this is the first time running this, you may need start instead of restart. you may have never seen the tail command. This says look at the last n lines (25) and pipe the output (take the output of one programme, and make it the input to the next programme) to more. More allows us to see a screenful of data at a time. To advance to the next page, simple hit the space bar. 6. And now, the tricky part. 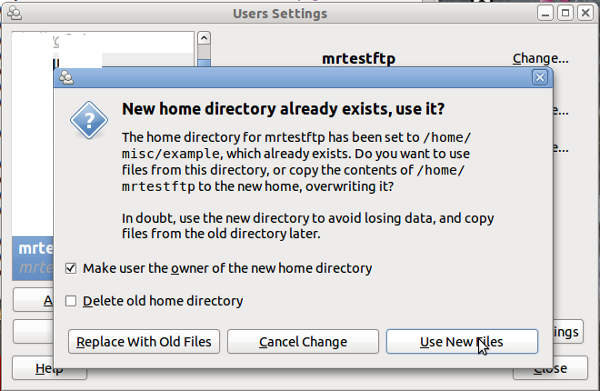 We have to change the home directory of our user (mrtestftp) from /home/mrtestftp to /home/misc/example. if the userid you want to use is there, great. Next step. If NOT, then edit the file /etc/group using your favourite editor, and add them. NOTE: ANYTIME /etc/group CHANGES ARE MADE, YOU WILL NEED TO LOGOFF/LOGIN FOR THE CHANGES TO TAKE PLACE. BE CAREFUL HERE. We are going to change the group from mrtestftp to users. This way any local user can access these files. Alternately, you can use chgrp as well. NcFTP 3.2.4 (Apr 07, 2010) by Mike Gleason (http://www.NcFTP.com/contact/). 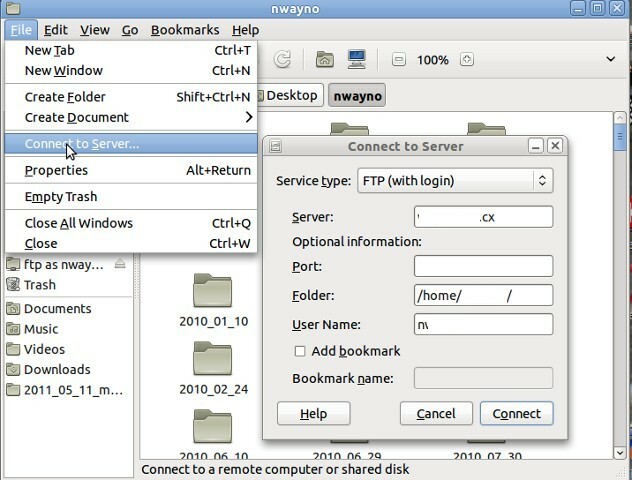 "Welcome to Wayno's FTP service. " 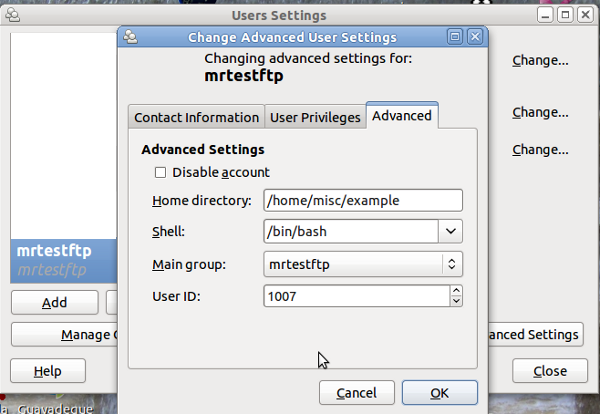 Password requested by 72.202.67.25 for user "mrtestftp".